Drop-in for free fun activities for parents/carers and their children on the PlayTalkRead bus in East Lothian on 12th/13th May. 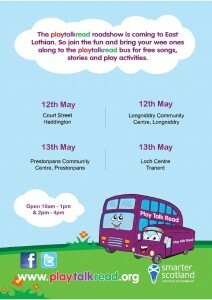 The bus will be hosting free storytelling and rhythm sessions and a range of play sessions for children aged 0-4. This entry was posted in Announcements on May 9, 2014 by Admin.